1. Conventional Partial Dentures - These have metal frameworks and metal clasps that snap over certain remaining teeth to gain support. 2. 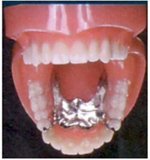 Hidden Partial Dentures - These partial dentures are made to show as little metal as possible. Either the clasps are designed in a way to minimize their appearance, or "attachments" are used. These are little devices buried in the denture that lock into crowns for stability, but are not visible to other people. 3. 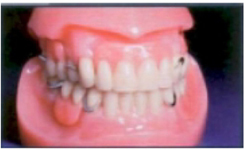 Flexite Partial Dentures - These are all acrylic partial dentures that have either pink, white or clear acrylic clasps. The clasps almost become invisible because they blend in so well.